College graduates with student loans often dig themselves deeper into debt. Those under 40 years old have almost twice the overall debt load of those who graduated without student debt, according to a Pew Research Center report issued Wednesday. That's because they are also racking up car loans, credit card debts and mortgages. 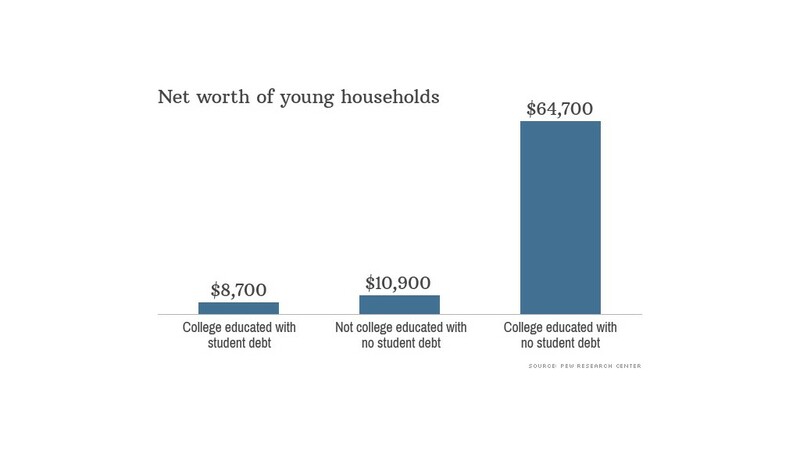 The median net worth of young households with student debt stands at $8,700, way behind peers without student loans whose median net worth is $64,700. And despite earning higher incomes, college-educated household wealth lags those in which no one received a college education by about $2,000. "We're not saying college was a bust. We're simply saying that young adults with student loan debt are far behind in building their nest eggs," said Richard Fry, the author of the report. Net wealth isn't the only thing people worry about, though. Income is important and college graduates outearn those with less education, according to the report. The typical household income of college-educated student debtors is $57,941, nearly twice that of those who do not have a bachelor's degree -- and that gap is growing. While the report does not conclude why college grads with student loans end up digging deeper into debt, it points to the fact that those with greater incomes are able to take on more debt. Still, the number of graduates leaving school with debt is growing. The percentage of young U.S. households that have some student debt has reached its highest share since before 1989, according to the report. About 37% have outstanding student debt, at a median amount of $13,000.